Ever wonder if a police officer’s been on the wrong end of a TASER? Do they even understand what kind of pain they’re inflicting? Well, as a matter of fact, yes. 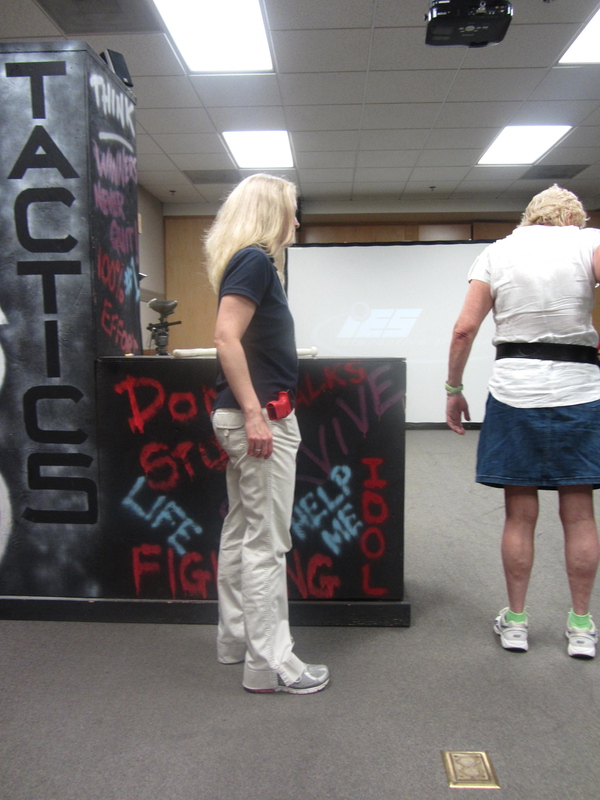 At least in the Los Angeles Police Department (LAPD), where every recruit gets a real shock during training. 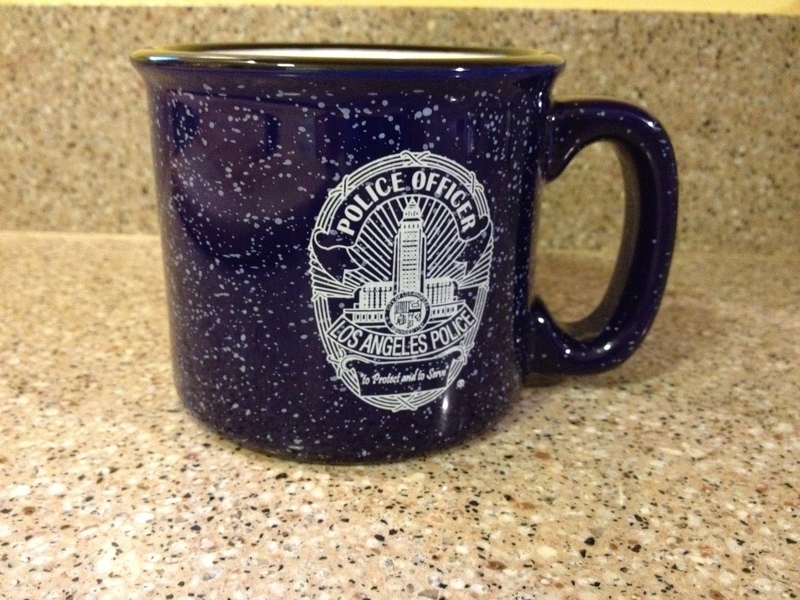 Tuesday’s post was all about my morning with the LAPD while I was out in Anaheim for the RWA National Conference. But that only covered what we did before lunch. More fun awaited us in the afternoon at the Edward M. Davis Training Facility in Granada Hills. 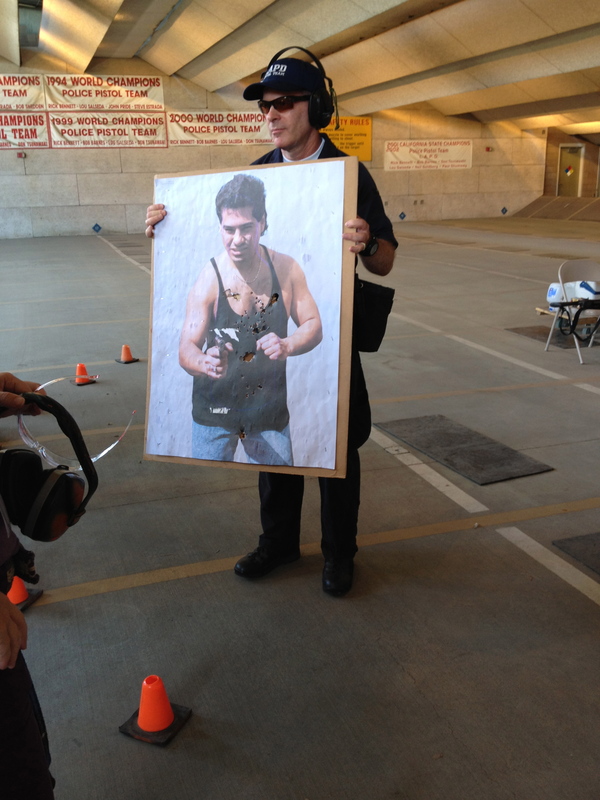 My group started with a TASER demonstration. I won’t go into the specifics on the TASER since I already covered it in my post on the Fairfax County PD, but getting to see a TASER in action was new. I certainly wouldn’t want to be on the wrong end of that weapon! The real fun came with a demonstration of the Force Option Simulator (FOS). The FOS is like an oversized video game where you react to what’s happening on the screen. My partner and I were issued simulated weapons–heavy like a real handgun–and stood before a large video screen where a scene played out with a bank robber running from the building with a duffel bag. When he pulled a gun, I shot three times, missing the first time, hitting him in the lower leg the second, and getting him in the chest on my third shot. I was proud of my aim, but unfortunately, his getaway driver—whom I hadn’t even noticed—shot me. Oops. Situational awareness, anyone? Sadly, my partner didn't manage to get her gun out of the holster. The pictures of us in action didn’t come out, but I have a shot with my red “gun” for posterity. 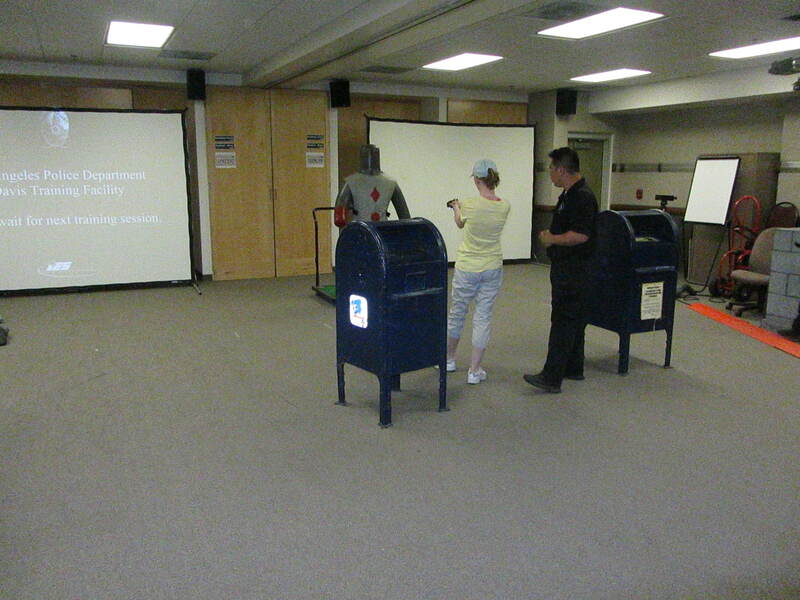 Next up was the live shooting demo. We got an overview of some of the scary weapons officers face on the street, and a rundown of some of the firearms they have in their arsenal. 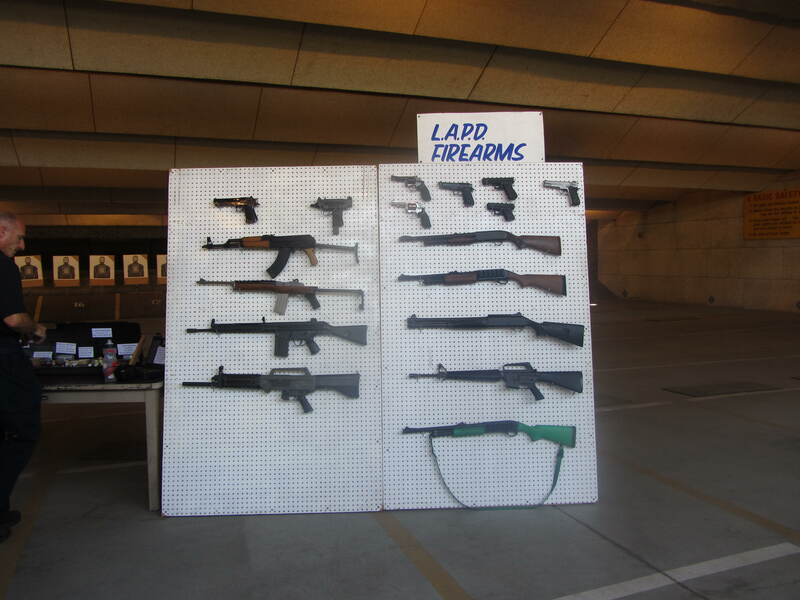 A couple of officers from the LAPD shooting team demonstrated the power of a Springfield Armory 1911, .45 ACP (Automatic Colt Pistol), and a Benelli M4 Super 90 semiautomatic shotgun (see video). Apparently, a lot of people think a shotgun sprays pellets all over the place and will take out several people with one shot. According to the target (see photo, the groin “injury” is not related…) that’s not the case. While the shot does spread out, it still stays pretty tightly grouped. Devastating to the target, but not so much to anything around it. Talk about pulling Gs! Nauseating, but in that fun, can’t-stop-laughing-and-screaming, roller coaster ride sort of way. Every time we took a tight curve I swore the car would flip. 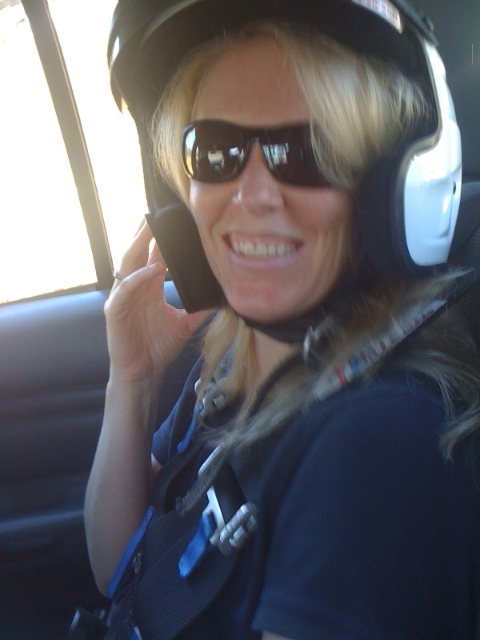 The tires chirped and my gut rolled, but we held tight to the road. I had fun on the FCPD track in the spring, but this ride was beyond awesome. My stomach got a chance to relax with our last presentation of the day, a visit with the Volunteer Surveillance Team (VST). The VST is a group of civilians living in the area they serve who get special training to watch for and report criminal activity. What a cool concept. When crime goes up in an area—say burglaries or graffiti tagging—the LAPD can send in the VSTs. These men and women use their own vehicles to surveil assigned areas and call in crimes in progress. Unlike cops, they go unnoticed by the criminals, giving the police a chance to catch the bad guys in action or just after they commit a crime. Often the culprit wonders how the police knew he was there because the VSTs never get involved in the actual apprehension. They brought up the common scenario of thieves knocking on the door to a house and then breaking in when no one answers. My question: What should I do if I’m home but don’t want to answer the door? The answer: Make noise so they know someone’s home. It might feel rude to let an innocent salesperson know you’re deliberately ignoring his or her summons, but it beats being burgled or robbed! Besides, you didn’t ask them to knock on your door to sell you vinyl siding, tree trimming, or a faster Internet connection. That locks up my day at the LAPD. I hope you enjoyed the recap. If you ever get a chance to visit your local police department or be part of your citizens police academy, I highly recommend it. Writer or not, it’s worth your time. Photo credit: All photos are my own work except the one of me in the helmet, which is used by permission from Kristina Allew. Gwen – Just signed up for the Asheville NC Police Department’s Citizens Police Academy, eleven weeks (1meeting/wk) of training. I’ll have a report on my website/blog in December: http://www.PennySummersMysteries.com. And, BTW, still promoting your Scrivener on-line course! Great, John. I hope you enjoy it. I was amazed how much I learned, not only about my police department and programs, but about my county. Very enlightening. Thanks for being so eager to spread the word. I appreciate it! I look forward to your CPA recount. Have fun! Yay, Maura! I think every citizen would benefit from the behind-the-scenes look at the police, plus a chance to meet them under good circumstances. If you get a chance, do a ride-along.